An unofficial guide by David Buckley. Depending on your point of view, PCStage is a lighting controller with Multimedia extensions or a sound effects playback system with a lighting controller or a (multiple) cue-list based show controller that can also control lighting control and do sound playback. First off, let me say that this isn't official information for PCStage; I've just written up this page as a happy user of a great product, in the hope that someone finds it useful. Back to the plot. PCStage is a bit too flexible for convenient pigeonholing, so I'll try and list some of the things it does. PCStage is a lighting control package, supporting today a single DMX512 universe. Support for as many as three universes is in testing as I write this. As PCStage started as a lighting control product, it has the user interface paradigm and terminology of a lighting control package. The main screen is split into a number of sections. Three of the four sections, namely the faders, the preset-list and cue-list are grouped together and called a desk. There can be many desks. The fourth section, the control panel section is fixed and common across the desks. As this is a show controller's introduction, I won't dwell on the lighting control features, but suffice to say that PCStage is a capable lighting control desk for both conventional and robotic lighting fixtures. It's not a Grand MA, but its pretty useful. PCStage can do WAV or MP3 audio. You can have an unlimited number of stereo audio "tracks", each of which has its own volume and pan control, which are of course automatable. Each track can be independently assigned to a real audio device (WDM) on your PC. Each track can play back one file at once, so to have multiple simultaneous files playing back, just create more tracks. If you have multiple soundcards or a multiple output soundcard or USB audio device, as long as they have WDM support, you can assign tracks to any output device. Additionally, there is support for mono .WAV file playback to ASIO devices for those high-end specialist devices that don't have WDM support. Also, PCStage has support (using a plug-in) for CD Audio. Multiple drives are supported, and automation of track selection and volume, but there is not the comprehensive assignment that .WAV tracks offer - you need to do that through Windows. PCStage has a reasonable MIDI implementation, it can generate all channel voice messages except pitch wheel, but it doesn't do channel mode, system common or system realtime messages, or sysex. Incoming MIDI messages can be used as triggers - see later. MIDI messages can also be used to control lighting using "MIDI fader mapping". PCStage can generate MSC messages, using the MSC plug-in. Received MSC messages can be used as triggers - see later. PCStage can generate serial (RS232) messages. Received serial messages can be used as triggers - see later. PCStage has a TCP/IP socket implementation that allows other TCP/IP compliant software to submit PCStage commands. PCStage has no outgoing TCP/IP support. The PC's keyboard can be used to generate triggers. The PC's joystick port can be used to generate triggers. The MediaSync plugin enables a second video display (for example connected to a projector) to show video, allowing a single screen video playback with no external hardware. This plugin will also play back audio files. The other interesting feature of this plugin is that it allows triggers to be generated relative to track playback position, accurate to about a tenth of a second. From the show controller's perspective, cue lists are probably the most important element of the control system. PCStage, of course, has cue lists, and this section details cue lists and the ways to work with them. PCStage can be driven by commands. One of the most frequently used commands is the FadeCue command, which causes cue list movement. A FadeCue command can be either to step to the next (or previous) cue, or to a specific cue. Commands can be input manually (i.e. you type the command string into a text input), or can sent to PCStage across a network using TCP/IP, or can be issued by a trigger mechanism. A trigger is an input that causes a command to be executed. The input could be any type of input, a key press, a MSC message, anything that PCStage supports. You configure a trigger by going to the list editor for the trigger type (e.g. MIDI), defining the message that PCStage looks for (e.g. a specific note on), and the command to be executes when that trigger is received (e.g. 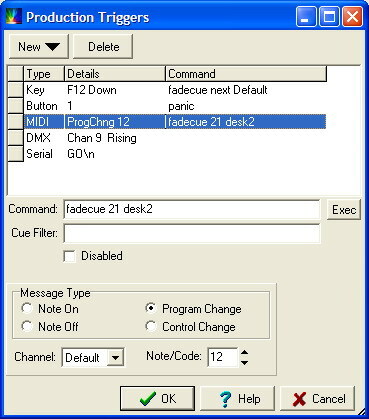 FadeCue next Default, which would step the cuelist on the Default desk on one step). 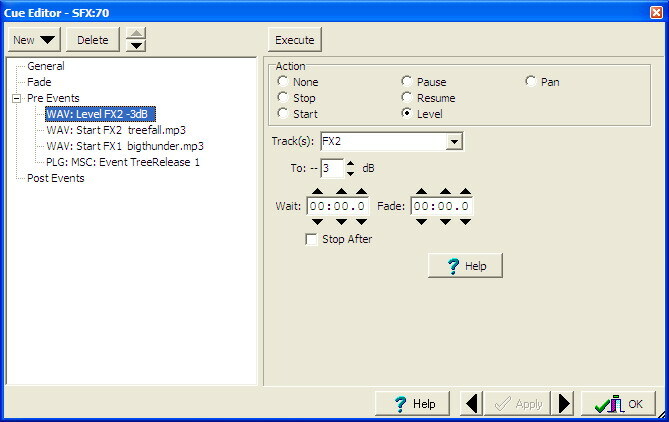 There are two places where triggers are set up, either in the Production / Triggers... menu item, which set up triggers for those things native to PCStage, as shown in the first screenshot below, or for plugins, each has their own mechanism, as shown in the second example screenshot (for MSC) below. An event is something that PCStage does, other than a lighting change. Lighting changes are configured in the cuelist by specifying a preset, and a selection of cross-fade times. Events are specified using the event editor mechanism. There are two types of event, pre-fade and post-fade. Pre-fade events are executed as soon as the cue-list item has been invoked. Post-fade events happen after the fade has completed. Big gotcha - if there is no fade time set then the post-fade events are never executed! Fade times are set on the "Fade" tab (not shown). The official PCStage website is here. To set up a PCStage system, go to the download download and install the current production version of the product. Finally, following the links on the download page, download plugins to taste. These are installed in a c:\pcstage\plugins directory, which you need to create yourself. Documentation for each plugin is in the form of an HTML file in the plugins directory. To get you started, I've setup an example from John Huntington's "Control Systems for Live Entertainment", the thunderstorm example. In the book version, the thunderstorm is presented via a single cue-list, and I've canned the thunderstorm using the same approach. However, I've wrapped the thunderstorm into a baby one-scene show with lighting control and an announcement on another "master" cue-list, thus creating a simplified real-life full show scenario. You can also trigger this show from an external MSC controller, I've configured the triggers to be Lighting / Go / '1' for the first set of effects, and '2' as the second. (F0 7F 06 02 01 01 31 F7). You can of course change the trigger commands, most easily by capturing the command you want to respond to in the monitor, press the "To Ttrigger" button to make it a trigger, then edit the triggers to have the same PCStage commands as the existing example. The then original triggers can be deleted. If you have SCS Professional, then here is a two-item trivial example that will trigger the thunder show. If you are running it all on one PC, then the above mentioned MIDI Yoke will provide virtual MIDI ports to connect the applications together. 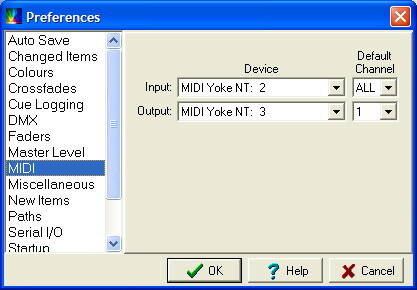 In this pair of screenshots, virtual MIDI port "MIDI Yoke NT: 2" is the common "port" being fed MIDI by SCS, and PCStage is configured to accept MIDI on this virtual port.